The P2PU learning circle project began with the belief that there are tons of good online courses out there, and that we just need to better curate and frame these resources if we want more people to gain meaningful access. Three years into the project, we feel that this belief is only partially true and that, in reality, “the market” is not producing a reliable, long-term content solution that will sustain learning circles indefinitely. A group of librarians nervous to put a Lynda.com course on a projector screen for a group of patrons to work through together because they are infringing on Lynda’s copyright by doing so. 35 Kenyan adults coming to the Nakuru public library to take a community journalism learning circle, only to find that FutureLearn had removed the course from the internet the day before. A motivated librarian in Boston excited to run a fiction writing learning circle, but not able to find a single course that she thinks is good enough. 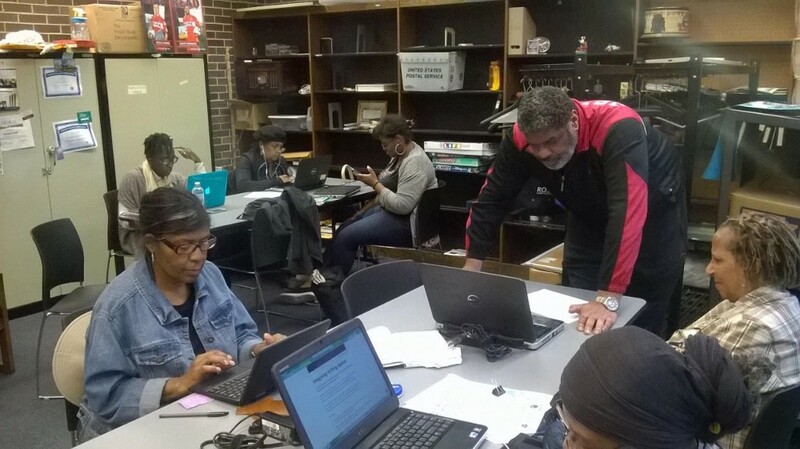 A group in Chicago and Milledgeville, Georgia that try to use an openly-licensed job skills course but give up after a week because the course is geared exclusively towards white collar work. P2PU and Kenyan librarians spending 1-hour of a day-long training with librarians in Uganda helping them to navigate beyond Coursera’s new user interface which makes it nearly impossible to identify how to access courses for free. While P2PU could continue to devote more time to training librarians and learners about how to work around paywalls and create their own resources, we feel that there must be a concerted effort to aggregate and develop OER that is explicitly designed for the learning circle model. Libraries and other community based organizations are the best positioned organizations to know what topics their patrons need, yet the status quo relies on platforms and models that are ill-suited to achieve our vision of accessible, equitable learning opportunities for all, for free, as not all e-learning resources fail us in the same way. Here is an overview of the major categories of resources that public libraries seem to be using for e-learning, along with a description of why they are insufficient. Well before the dawn of MOOCs, public libraries had relationships with proprietary vendors such as Lynda, Cengage, and EBSCO. Despite the mission of public libraries, they spend an enormous amount of money each year licensing educational content from these companies. A City Council briefing from Virginia Beach indicates that the Virginia Beach Public Library system spent $577,012.58 in FY2016 on digital content subscriptions, working out to approximately $1/resident/year. This included $67,375 to access Cengage Career Online High School, $20,000 to access LyndaLibrary, $12,720 to access EBSCO LearningExpress, and $9,442.14 to access Gale’s Opposing Viewpoints, an online database that provides pro/con resources for contemporary social issues. The large amounts of money being allocated to these vendors is troubling for a few reasons. Firstly, this rental payment constitutes a drain on library (read: public) resources, as they never actually own any of the content they are accessing. As libraries devote more of their content funding to these subscriptions, they are unable to invest in developing their own resources, starting a cycle that leaves the libraries vulnerable to dependence and lock-in. Secondly, while these resources are consistent and generally well-produced, they are often top-down in pedagogical framing and always situated within a walled garden, mitigating the opportunity to teach how to learn. These courses always present themselves as having the answer, rather than helping people to seek their own answers elsewhere (online, in the library, elsewhere in the community, etc.) For this reason, most online delivery of learning material is often not in and of itself revolutionary, rather it represents a digitization of learning with the same embedded power structures as traditional education (teacher versus learner; copyright versus learning). Many libraries have used proprietary resources for learning circles, indicating to P2PU that learning circles have been a great way to get people to take advantage of otherwise little-used resources. While this is good to see on one level, it worries us if our work is being used primarily to justify high annual payments to corporations that seldom reflect the needs and learning styles of library patrons. Massive open online course platforms are decreasingly massive and open. The massive element, initially promoted as a way to generate group learning, is not important in learning circles and each face-to-face community engages in it’s own social learning experience. For us, this means that the courses are essentially just scaffolded, multimedia webpages that help somebody learn a new skill.The nice thing about these courses is that, generally, they offer a time-bound learning experience that is designed to learn a tangible skill. The bigger problem is the move away from open. Once touted as the silver bullet that will democratize education, many MOOC providers are coming under pressure to develop a business model and monetize. As such, it is increasingly difficult to find courses that are reliably free and available. Coursera has buried the free audit option beneath layers and layers of prompts to subscribe and pay for a certificate. edX, despite offering CC licensing, doesn’t seem to be pushing it very hard as 0 of the 58 edX courses that have been used for learning circles carry the CC license. (University of Delft, who was instrumental in adding CC to edX continues to use the license). The trend towards paywalls (or at least confusing user interface that caters towards paywall) is well documented. For P2PU, it has meant that we can not reliably recommend particular courses, as things that emerge one month tend to be gone the next. The Open Educational Resources (OER) movement has not evolved to a level in which P2PU feels comfortable telling our library partners to stop paying annual subscription fees to vendors. 86% of the 289 unique online courses that have been used in learning circles since 2016 have a copyright attached, despite the fact that we actively prioritize OER whenever possible. Our partners have generally, though not exclusively, found OER to be of lower quality than other resources, and thus we find ourselves hesitant to unequivocally recommend Saylor Academy courses, as much as we would like to. While learners are not burdened by subscription requests or confusing login portals, a lot of OER that we come across is either not deep enough to sustain a learning circle (e.g. a single lesson plan), or it suffers from link decay or other maintenance issues that make it effectively unusable. Another issue that P2PU has come across with OER is that the vast majority of OER projects are geared towards university students. Openstax, University of Minnesota Open Textbook Library, and BC Campus OpenEd provide wonderful open access textbooks, but these resources are inadequate as is for a group of adults looking to study together at the library without an instructor. Other project such as MIT OpenCourseWare and CMU Open Learning Initiative present materials in a course format, but as semester-long university courses, which is also not realistic for the communities that P2PU and our library partners are primarily looking to reach. OERu has been a consistent exception, developing openly-licensed courses with university partners that are rigorous and thorough, yet easily accessible and usable by non-university audiences. A diverse range of organizations, from coding bootcamps to former MOOC providers, have landed on pay-for-employment as a business model for delivering online learning. For Udacity, this switch happened after a widely-publicized pilot project to run MOOCs in community colleges failed. In the new model, students pay a few hundred to many thousand USD in order to gain access to online courses and accompanying resources (such as tutors) to learn a concrete skill, with the dangling carrot of job connections at the end of the program. While the tie-in to the labor market is motivational for many learners, the upfront costs to learners prohibit this from being a viable program for P2PU/public libraries to endorse. It is worth mentioning that so much of learning online still happens in informal, non-scaffolded spaces in which somebody has a question and is able to find an answer online. Learning circles have demonstrated that first time online learners can succeed with group support, and resources like Wikipedia and Youtube are a treasure trove of learning and exploration. However, on their own, we’ve found that these sites are insufficient to get a group working together. Generally, these resources put more burden on the facilitator to create a course around a resource, which is time consuming and not in the spirit of peer learning. They will be in a better position to shape the content and the direction of the OER Collective than they ever would have been with any private content provider. They will increase brand-recognition with their name attached to OER. They will gain access new forms of professional development for staff, patrons, and volunteers who want to be involved in the course development. They will become part of a vibrant interlibrary, multinational community. They will gain access to alternatives to locked-in dependence on proprietary content, change the power dynamics of vendor relationships. They will improve utilization of library assets and programs by investing in adult programming, rather than making rental payments to corporations. They will pay for development of resources, not access to them. They don’t need a full time team at the library to maintain these resources. They are making an investment in open culture. The size of the investment is flexible depending on the libraries needs and resources. We will generate long-term reliable income that gives learning circles independence from grant funding. We will be able to access discretionary content budgets from library partners, which is far more flexible and vast that professional development / adult service funding, which is how we are currently supported. We will be able to strategically fill in OER gaps, creating a stronger ecosystem for online learning, and a better learning circle product. All resources generated as part of the Collective will be free and open, available to anyone who wants them. While the courses will be designed for group study, they will also be usable by individuals who are not participating in a learning circle. P2PU has already done considerable work to both develop and curate some of the best free and open online courses, so we feel well-prepared for this work. We will not embark on this project alone, but with partners across many fields, including community organizations who want better OER, online course providers who are willing to openly license their materials, and open source OER development projects. We’re currently in the midst of putting this all together, and are eager to hear from individuals and organizations that would like to be involved. Despite the shortcomings of online learning thus far, we still believe in the transformative power of learning circles, and we hope that our work can positively shape the field going forward.